The First Complete History of the Military Force of Colonial Pennsylvania, a Volunteer Body Created as a Practical Response to the Ideal of PacifismKnown at various times as the Military Association of Pennsylvania, the Pennsylvania Association, or simply Associators, this long-neglected organization represented a new constituency in Pennsylvania politics and by extension, a new American response to arbitrary rule. Organized on December 7, 1747, at Philadelphia, the Military Association, an all-volunteer military establishment pledged to the defense of Pennsylvania, served as the de facto armed force for Pennsylvania, a colony whose leadership, a loose coalition of Quaker and German pacifists, land barons, and merchants, foreswore military preparedness on religious and ideological grounds. For the Associators, including their most noted supporter, Benjamin Franklin, a defenseless colony was no longer practical. During the War of Austrian Succession and again in the Seven Years War, Associators organized defense efforts in defiance of the Pennsylvania colonial leadership. Associators also helped defend American Indian refugees against the infamous Paxton Boys in 1764. By 1775, Associators found themselves as the colony s only legitimate military leadership and, by capitalizing on electoral gains in the lead up to the American Revolution, Associators assumed offices vacated by former officials. During the critical battles of 1776, the Associators in their distinctive round hats and brown coats proved a decisive asset to the Continental Army. 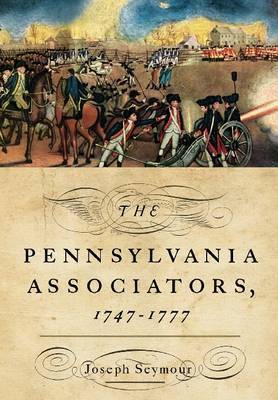 In The Pennsylvania Associators, 1747 1777, historian Joseph Seymour has painstakingly researched primary source materials in order to write the first comprehensive history of this influential organization. Seymour demonstrates that while the Pennsylvania Associators contributed to success in the campaigns in which they fought, particularly the battles of Trenton and Princeton, a more fascinating and important investigation are the concerns that motivated these men. Associators considered military service in defense of their religious and civil liberties as a natural right. For three decades, Associators demonstrated that belief in and out of uniform. In a colony founded on religious exceptionalism, Associators saw themselves as faithful soldiers and active agents against leadership by entitlement, a principle guiding our government today.